Having woken up reasonably early to pack-up the campsite, so we could hit the road to make our ferry from the mainland of Scotland to the mainland of Orkney – there were a few minor bumps along the way. There were a couple of toilet breaks and then we had to pull over, because Trav said the muffler on Carhouse wasn’t working properly, then when we did finally make it to Gills Bay, where there was quite a long wait to board, considering we had arrived early. While we waited we made lunch in the back of Carhouse, then we were finally able to drive on. Once we were on our way, the Pentland Ferry ride - which only took an hour, was enjoyed mostly from the safety of the inside lounge, sheltered by the ferociously cold wind. Though J and I did venture up to the top deck to try our luck at spotting Puffins or any other seabirds. We arrived at the Ness Point campsite in Stromness around 5pm and we were worried about setting up camp because the site manager wasn’t in and Trav couldn’t book J and I in over the phone, because it was “full*,” due to the Orkney Folk Festival being on that weekend. Though as soon as the site manager came back, he said of course there is room and the site we had decided on, next to Carhouse, was fine. He thought it was quite funny we had waited to ask. We just played cards in Carhouse and tried to stay warm that night. We decided that we would venture to the Island of Hoy today, so we woke up at a reasonable hour to catch one of the local ferries (which was quite a lot smaller than the one we came over on) and it was only a 30-minute journey. We even passed a seal colony on the way and then all of a sudden the huge hills on the island appeared out of nowhere; as if they were coming straight out of the water, with heavy fog covering the peaks. After getting off the boat, we started our trip by walking from the dock to the Hoy Kirk and Heritage Centre and had a look around at some old photos of the Old Man of Hoy. Not long after our quick gander and we were off on our hour and a half trek to Rackwick, passing the largest hill – Ward Hill on the way. 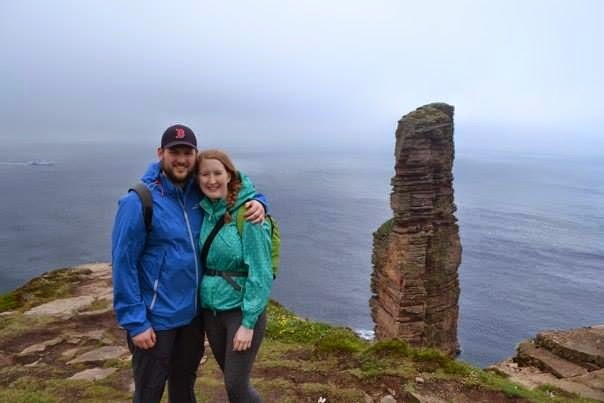 We then made it to Rackwick where we stopped to eat our packed lunches and to take in glimpses (there was lots of fog) passing over the dramatic cliff faces that make up St. John's Head – the highest sea cliffs in the UK at 350 metres. Then we hiked around the coastline to the Old Man of Hoy – which in total took us two hours. After asking a few random tourists on our way up about the duration of the walk there and back, we were quite nervous that we wouldn’t make it back to get the last ferry of the day. However, we did make it, it was probably one of the quickest walks of my life and although we didn’t get much time to stare at the impressive stone stack or to bird watch, it honestly didn’t bother me, due to the wind being so horrendous and not something that I was entirely used to (even though I’ve been living in Edinburgh for two years). But it was worth it to see that spectacular scenery – there were even people starting a climb up the stack when we were there. We did make it back to get the local bus from Rackwick – the driver ended up being a friendly local that we had earlier run into at the Kirk and he told us many of stories on the drive back to the port. He even pointed some things out to us that we didn’t spot on our walk. He then dropped us and some other passengers a the local café (one of two cafes on the island), where we waited it out for the ferry ride back to Stromness - J and I both enjoyed a piece of banana bread each. After arriving back in Stromness and going to the local Scotmid, J and I met up with Dweebs and Trav at the local pub, Flattie’s Bar, for a pint before going back to the camping grounds. We then chilled out in the lounge room (away from the wind) for the whole night and I somehow managed to stay up to 1am and saw the twilight sun that one can only witness in the wee hours of the morning. 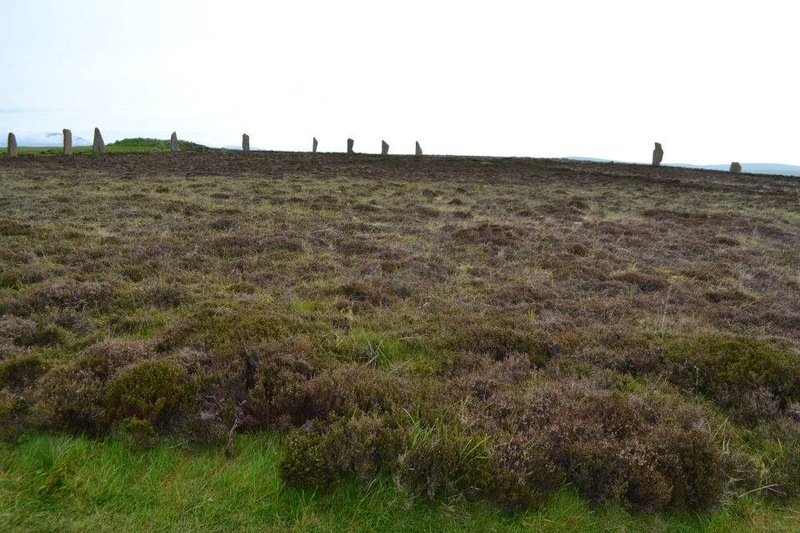 We tried to leave around mid-morning so that we could drive* around Mainland Orkney and see all the Neolithic sights. 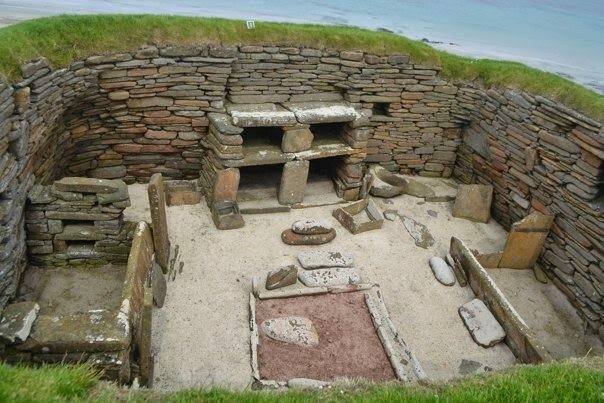 We stopped first at Skara Brae – a Neolithic village, set right on the gorgeous coast in the Bay of Skaill. Quite a fascinating place, older than the Pyramids at 3200BC, preserved for great length by a wall of sand dunes that been covering it for centuries. Though my attention span quickly focused on a baby bunny that was being it's cute and fluffy self, hiding amongst the grass on top on some of the Neolithic roofs. There was also an interesting museum that you first walk through, where you can engage in activities to help learn about the site and the artefacts that were discovered there and Skaill House (built in 1620) - where Laird William Watt of Skaill lived who discovered the site and where Captain Cook* once visited. We then went to Brough of Birsay where you have to cross a tidal causeway at low tide to go to it – which was quite fun. Once we were on the wee island we walked around the remains of a Norse settlement and I even spotted some seabird eggs nested amongst the ruins. After crossing back over to the mainland, not far from where we had parked the car, we walked down to the beach to get a closer inspection of another colony of seals. It was quite funny walking on this particular type of seaweed/kelp that had these bits on it that popped when you stood on them. I nicknamed it the ‘bubble wrap’ of the sea. 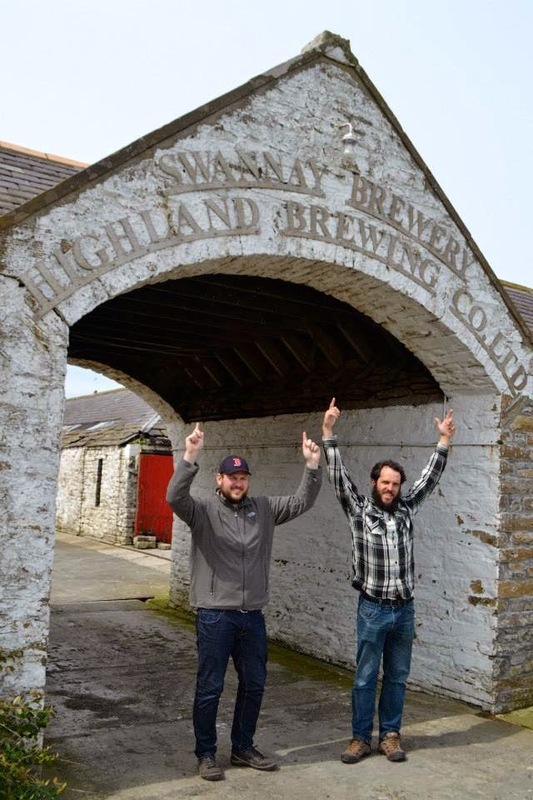 We stopped at the Swanny Brewery (owned by the Highland Brewing Co.) that Trav had learnt of from his job at the Cask & Barrel (Newington). We waited around for the manager to finish up cleaning the … and he gave us a little bit of a tour around the place; including the chilled room, where he stores all the hops and explained a bit about the type they use, including one type of British-grown hop and a few American ones. He finished up the tour, by giving us a bottle of beer each. Giving Dweebs and I a bottle vintage Porter (man that was delicious). The boys standing in front of the brewery. After a few novelty handstand* photos it was another short drive back to the campsite where we had a quiet night celebrating our last night with Dweebs and Trav on this trip with a wee party in Carhouse. We woke-up super early at 4:30am to pack-up our tent and the rest of our stuff. I wasn’t particularly happy about having to wake-up that early, but it was worth it once I got a glimpse such a beautiful sunrise across the water and on to Stromness. Our North Link ferry left the port at 6:30am and what a ferry it was – in fact the biggest ferry J and I had ever been on. It had a games room, a couple of cafes and bars and heaps and heaps of comfy seats. Though we just slept the whole time, due to lack of money and tiredness. Though I did stay awake just long enough for us to go past the Old Man of Hoy. J and I even ventured into heavy winds on the outside deck to grab photos of us in front of it. 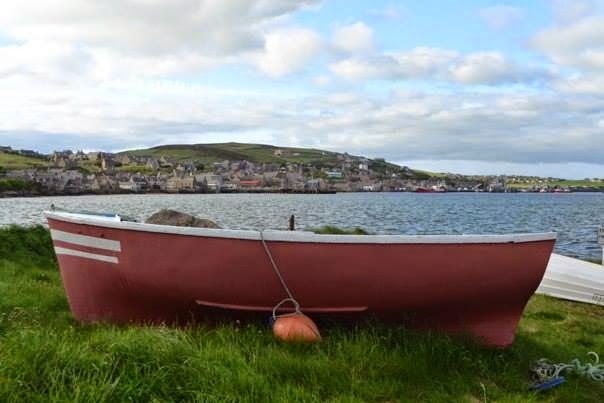 We arrived in Scrabster where we were waiting for the local bus to take us to Thurso so we could catch the Citylink bus to Inverness, but were heavenly surprised when the Citylink bus turned up first and the bus driver just let us hop on there. We waited in Inverness for an hour or two in the bus station, we even got talking to a lovely man and J went into town to get a couple of those lovely pasties, we had last time (Read here…). Then we were on our last leg of our tour of Scotland, which took us three and half hours, seeing us arriving back in Edinburgh at 4:50pm after getting up at 4:30am, but it was totally worth it. We were so glad that we were able to take such an amazing road trip through and around the Scotland Highlands. 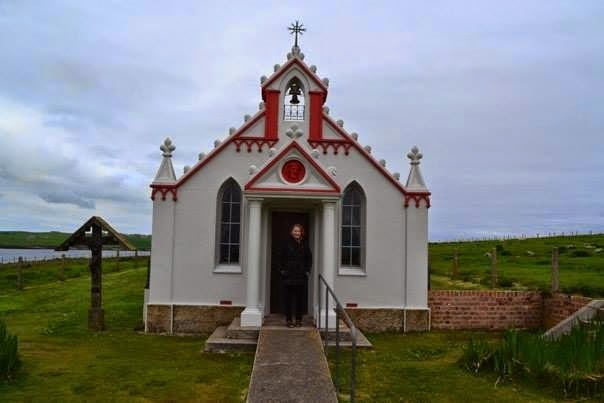 Stay tuned for more about my upcoming trip to Ireland and Northern Ireland (July 17 – July 24). *By ‘we’ I mean Trav; big shout out to him for being such an awesome driver and navigator on our trip. We couldn’t of seen and done so much with out him and Dweebs and their lovely home on wheels; Carhouse. * I say full with inverted commas, as when we arrived there was a huge site available for Carhouse and a huge space next to it, where we ended up setting up our tent. * We were fascinated to learn that the guy who discovered Australia, once visited here, this house was even home to his dining set that was used on his final voyage. I also found out through some research too that the site was later studied and excavated by an Australian archaeologist Vere Gordon Childe during 1927 and 1946, when he was a Professor at the University of Edinburgh. * Farmers are subsidised by the government for planting them to try and attract native birds to feed there. *The handstand photos were Dweebs’ idea and left us with a great photo of Trav doing a handstand with one of the standing stones in the background coming up between his legs. Unique Itinerary... and Amazing Post..